Ingredients: 1 bunch of green onions (5-6 onions), trimmed and washed, slice the white parts into 2 inch pieces, set a side, rough chop the green parts and set aside separately. Cut across the tails of 4 uncooked (4.4 ounces each) through the shell into 2 inch pieces. Leave a rather good piece that connects to the end tail and split the end tail lengthwise. Pat lobster pieces dry with paper towels. Sift 2 tablespoons flour and 1 tablespoons corn starch and season with a little ground pepper melange or Japanese pepper. Slice 5-3 inch coins of peeled ginger, and prepare 2 cloves of garlic, in a small bowl a mix of 1+1/2 tablespoons soy sauce, 1/4 teaspoon toasted sesame oil, a pinch of brown sugar, and a tiny piece if Chinese red-hot pepper. Have ready a wok and at least 1+1/2 cups canola oil…after heating the oil on medium to start turn up the heat to reach oil temperature of 350º, dredge the lobster meat sides in the flour blend, when the oil reaches 350º quickly sauté the pieces in batches for about 15 seconds, drain on a platter set at an angle. *I use a splatter screen to cover the wok as quick frying the lobster splatters a lot! Put the used oil in another saucepan to cool and reuse the wok to finish the dish adding back about 2 tablespoons of oil. Heat on med high and add the ginger coins sauté briefly and toss in the onion whites and garlic. 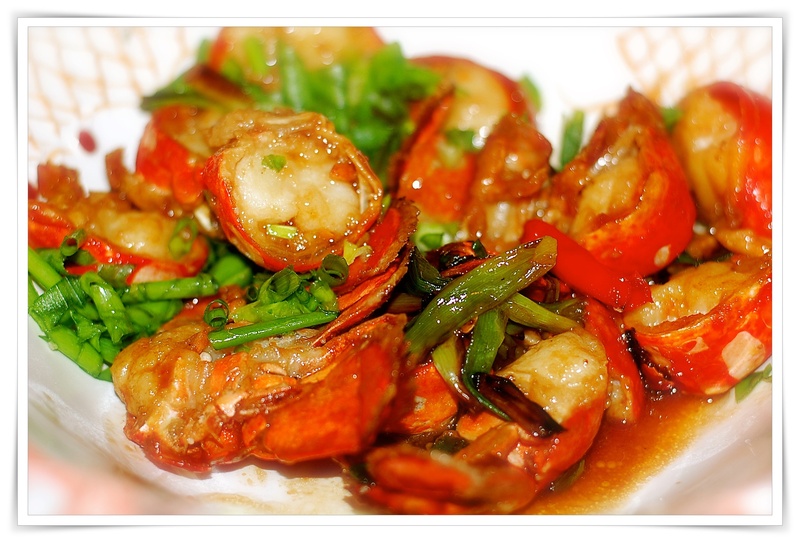 Add lobster pieces, toss briefly and add 1/4-1/2 cup rice wine and toss. Add the green onions and reserved soy sauce blend. I love those big bags of white shop towels for messy seafood dinners, dampened, squeezed out and warmed in the microwave.